Marcus Aurelius Numerianus was the younger son of the Emperor Carus. 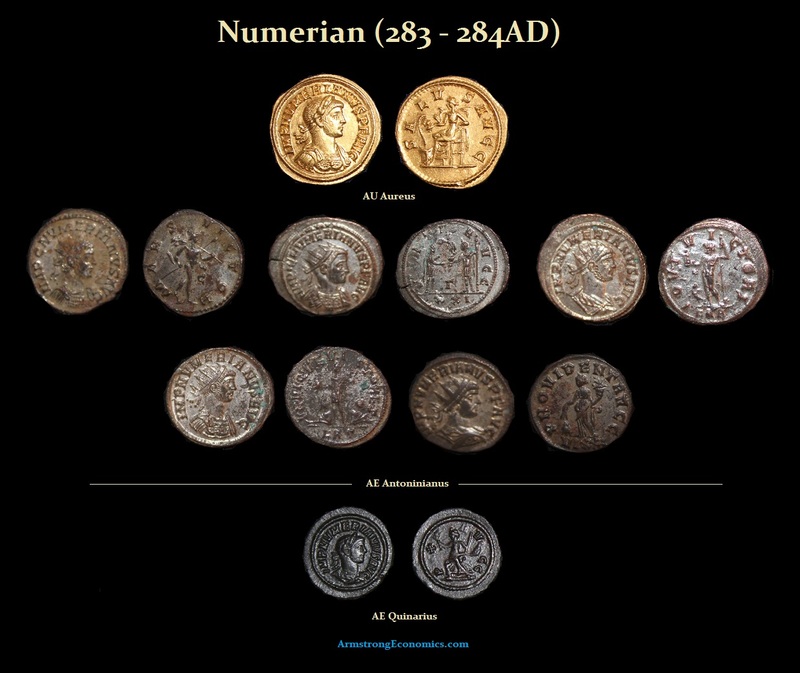 Numerian was born about 2540-254 AD, and was given the rank of Caesar soon after his father’s accession along with his brother Carinus. Early in 283 AD, Numerian accompanied his father to the East to deal with the invasion of the Persians once again. 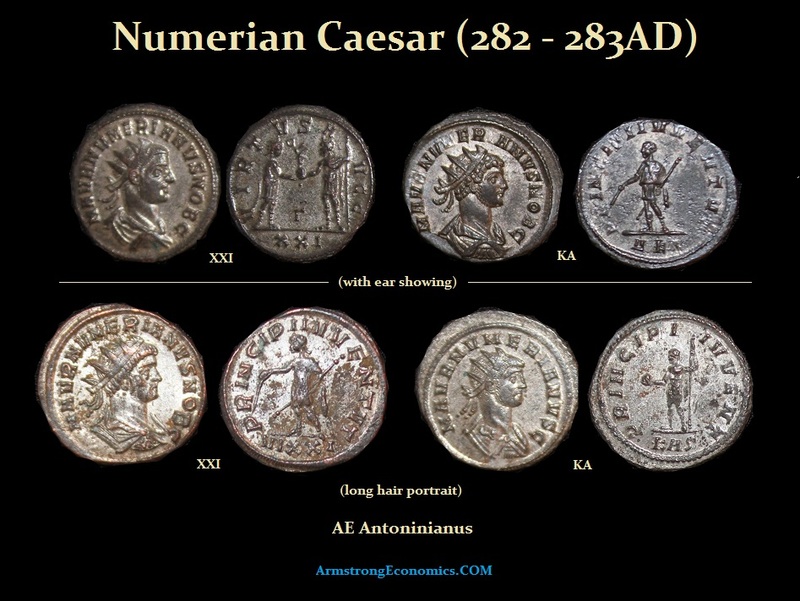 In September or October of 283 AD, Numerian and his brother were raised to the rank of Augustus. His father was initially successful against the Persians but died suddenly when he was struck by lightening. Thus, Numerian found himself in charge of the Eastern legions. Numerian was making his way back to Rome very slowly. When the procession neared Heraclea in Thrace by November 284AD, Numerian was discovered dead – murdered while in his litter. Arrius Aper, who was the praetorian prefect and father-in-law of the late emperor, was accused of the crime and was executed byDiocletian, the commander of the imperial bodyguards. Diocletian was proclaimed Emperor and marched the Eastern legions towards Rome to confront Carinus. 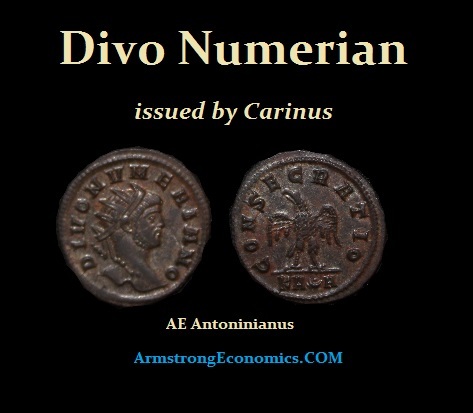 In the battle that ensued, Diocletian was outnumbered and it appeared that Carinus would be victorious. However, Carinus was murdered by his own soldiers for seducing their wives. Thus the Roman Empire fell into the hands of Diocletian. The memories of Carus, Carinus and Numerian were officially condemned by the state and their inscriptions ordered to be erased.